JaguarLandRover (JLR) is to build a new manufacturing plant in the city of Nitra in western Slovakia to build aluminium-intensive vehicles from 2018 onwards. With its established premium automotive industry, Slovakia is seen as an attractive possible development opportunity with the first vehicle to roll off the line being the new version of the Defencer which is currently made in Solihull, UK and where the last Defender rolls off the line in 2016. It is known that Henrob's self-piercing rivet (SPR) technology will be a feature of the new Defender. The move marks the next step in the JLR’s strategy to become a more competitive global business by expanding its manufacturing operations into new international locations in the future. The UK is the cornerstone of JLR’s business. It remains at the centre of the company’s design, engineering and manufacturing capabilities. Over the past five years JLR has employed more than 20,000 people taking its workforce to more than 36,000 and invested more than £11 billion in new product creation and capital expenditure. During this time, the company has invested heavily in its UK vehicle manufacturing facilities at Castle Bromwich, Halewood and Solihull to support the introduction all-new vehicles such as the Jaguar XE, Jaguar F-PACE, Range Rover Evoque and Land Rover Discovery Sport. JLR has also invested over £500 million in a new Engine Manufacturing Centre in the UK, creating 1,400 new jobs in the Midlands. In addition, it plans to expand its advanced engineering and design centre at Whitley, Coventry and invest in the National Automotive Innovation Centre at the University of Warwick. Any JLR graduates who have performed well can expect to take their place in assisting with the new facility in some shape or form. “With its established premium automotive industry, Slovakia is an attractive potential development opportunity for us. The new factory will complement our existing facilities in the UK, China, India and the one under construction in Brazil,” he added. As part of JLR’s commitment to deliver more lightweight vehicles, the plant would manufacture a range of aluminium JLR vehicles. It is anticipated that the first cars will come off the production line in 2018. JLR has made significant progress in building its international manufacturing presence over the last year. It opened a new joint venture in China and commenced construction of its local manufacturing plant in Brazil at the end of 2014. The creation of new international plants allows JLR to increase its presence in regions that have been identified as having growth potential, protect against currency fluctuations and achieve a more efficient, globally competitive business. Although no mention is made of it at this stage, the new plant could raise the prospect of a new stamping plant close to the body-in-white (BIW) and final assembly shops. 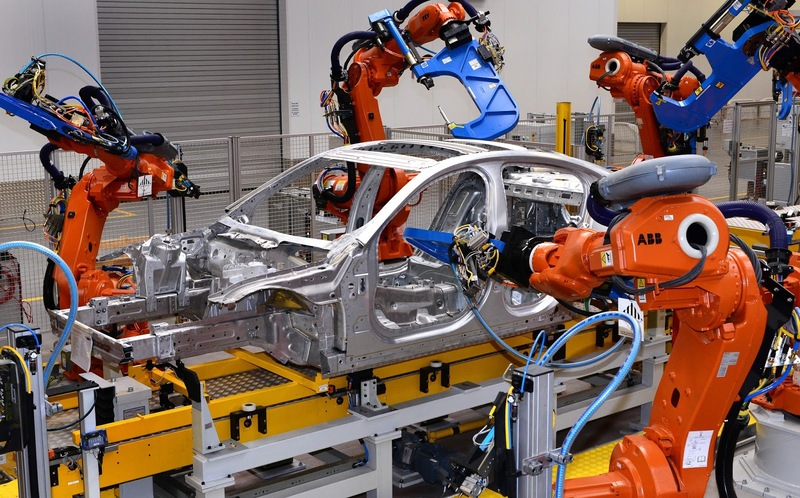 It is known that aluminium body panels do not travel well over long distances and with an eventual production tally of 300,000 vehicles a year, the facility will almost certainly need its own bespoke stamping shop. And, since handling aluminium sheet requires well-developed technology both in terms of stamping and assembly it is more than likely that two key players in JLR’s forward-thinking strategy will be aligned to the new facility. So, on this basis, Aida Engineering, the well-known Japanese press manufacturer which is already working on at least two major programmes for JLR will be first in line to win contracts for the Slovakia facility. By the same token, Henrob, now part of Atlas Copco, is so closely aligned to JLR and to the manufacture of aluminium-intensive BIW structures that it too must be first in line to win contracts to supply SPR technology to the Slovakia plant - as mentioned above. 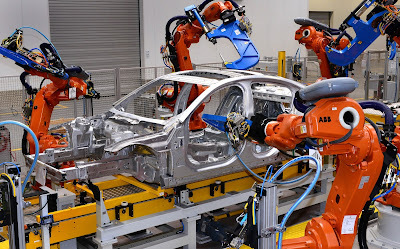 Also on the shopping list of JLR's purchasing staff will be ABB Robotics (see photograph above of XE production) which can expect a multi-hundred order for robots for the BIW shop, and by 2018 plans ought to be well in place to double capacity at the Wolverhampton, UK Engne Manufacturing Centre (EMC) where machine tool supplier MAG will be prominent. The extension of the site will a further example of the 'cut and paste' arrangement of Phase 1. By 2018, aluminium-intensive three-cylinder 1.5-litre derivative of 'Hotfire' should be well on the road and, with a planned capacity of 300,000 cars a year, the Slovakian facility ought to be able to justify its own MEC to simplify logisitcs and minimise transportation costs, etc, etc across the English Channel. JLR has also pencilled in I6 versions of 'Hotfire'. Lots of scope for further 'cut and paste' activities. And, wth new volume business to meet, ZF ought to be another well-pleased vendor which may have to make its own expansion plans to keep pace. Others likely to benefit include: Autoliv, Benteler International, Bosch, Brembo Poland, Continental Automotive Systems, Denso Manufacturing, Horiba Automotive, Leoni Wiring Systems, Maxion Wheels Italia and Trelleborg Forsheda. The net result is that any company not on JLR's vendor list will be crying in its beer!